To NASA’s knowledge, Triton is the only moon in the solar system that orbits in a direction opposite to the rotation of its planet [click on image (right) to enlarge]. Additionally, its surface is a study of contrasts, with smooth plains appearing to be right next to cratered surfaces. 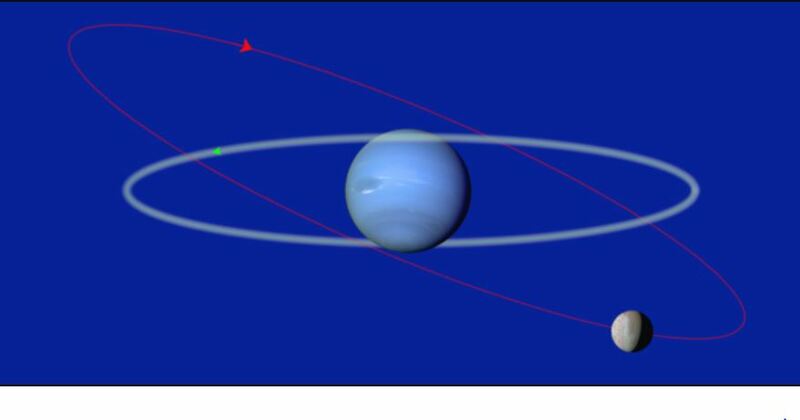 No spacecraft has gone to Neptune since the 1980s, but telescopes are capturing new data on Triton from the ground. A notable recent find was discovering seasons on the moon, using the European Southern Observatory’s Very Large Telescope in Chile. Renewed interest in Triton began shortly after the New Horizons mission flew past Pluto in 2015. NASA released the best high-resolution map of Triton to date in 2014 in anticipation of the flyby, because it is believed that Triton and Pluto could share a similar history. They are of similar size, have nitrogen in their atmospheres and also icy surfaces. Triton was found on Oct. 10, 1846, just 17 days after French astronomer Alexis Bouvard discovered Neptune. According to NASA, Triton was known simply as “the satellite of Neptune” until 1949, when a second moon (Nereid) was found. All of Neptune’s moons, according to International Astronomical Union guidelines, are named after Roman or Greek mythological characters associated with Neptune, Poseidon or oceans. Astronomers had to wait well over a century to see Triton as more than a dot, however. In 1977, NASA sent two Voyager probes on a one-way trip through the outer solar system, taking advantage of a rare planetary alignment that allowed them to move from one location to the next without using a lot of fuel. Voyager 2 flew by Neptune and its system on Aug. 25, 1989. Among the spacecraft’s most stunning finds: icy volcanism is likely taking place on Triton’s surface. Voyager 2 took pictures of “several geyser-like volcanic vents that were apparently spewing nitrogen gas laced with extremely fine, dark particles,” according to NASA. The agency estimates the particles go as high as 5 miles (8 kilometers) before flowing downwind and striking the surface. It also appears that a large portion of the surface has melted. NASA said the melting was probably due to tidal heating that began when Neptune captured Triton, which could have left the satellite liquid for at least 1 billion years. 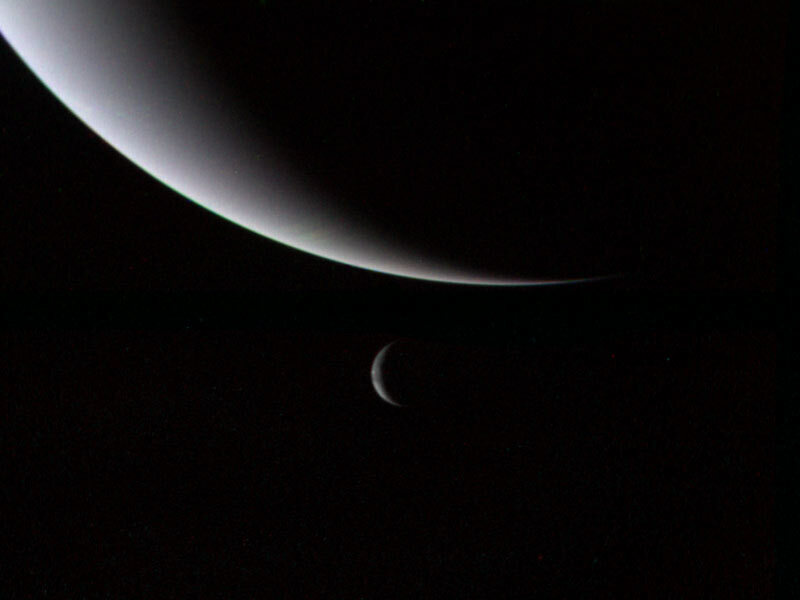 In 2010, long-range infrared observations with the European Southern Observatory’s Very Large Telescope revealed that the thin atmosphere of Triton changes with the seasons. At the time the VLT looked at the planet, it was summer in the southern hemisphere, where the sun’s warmth thickened the atmosphere.